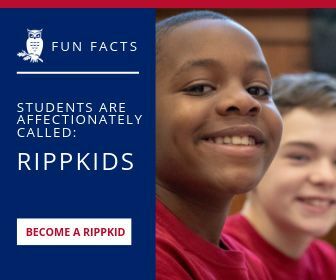 We believe RippKids have limitless potential. Imagine what your child can achieve when given the space to dream, to do — to dare to be true. We've created an innovative program designed to develop a growth mindset. Our immersive and experiential curriculum deepens learning, and strong student/teacher bonds help students thrive. As a PreKindergarten through Grade 9 school, RCS is uniquely suited to challenge and nurture students through these critical wonder years. At RCS, students develop the social, emotional, and intellectual skills young minds need to embrace new ideas, overcome challenges, and confidently problem-solve. Upon graduation, RippKids are uniquely prepared to chart their own paths as independent thinkers, confident communicators, and engaged leaders. They can go anywhere from here. Times have changed. You need a school that can keep up. Innovation is about generating excitement. When a child is excited to learn, their enthusiasm translates into a genuine love of learning. Innovation@RCS goes beyond the classroom and integrates all facets of RippLife including the arts, athletics, wellness, service learning, and leadership. By using a hands-on approach to education, we deliver authentic learning experiences and develop critical problem-solving skills. These are skills that will serve students well throughout their entire academic career and prepare them for opportunities that haven’t even been thought of yet. This is true 21st-century learning. We built our 100-year history on the impermeable foundation of family and community. Generations of students from Westchester, Fairfield, Putnam, and Bronx counties have walked these halls and continue to be an intricate part of the RCS mosaic. Our community grows with each new family that joins RCS with a firm belief in our mission, vision, and values. Our commitment to diversity, equity, and inclusion adds vibrancy, enhances learning outcomes, and enriches everyone’s experiences. Over 3,000 students have graduated from RCS, and this dynamic alumni network gets stronger each year. Students are exposed early and often to a host of experiences outside the traditional classroom to build broader, more meaningful connections to the world around them. From day and overnight excursions to guest speakers and visiting artists to sporting and school spirit events, students receive a well-rounded educational experience that raises their global awareness and fosters in them a strong sense of community. As middle school specialists, we focus on the academic, social, and emotional needs typical of this age that are often overlooked in college preparatory schools. We know how young minds work and have constructed a program specifically designed to treat students as talented leaders, communicators, and innovators. Preparation starts in the early childhood program and iterates as they get older. Students learn how to become creative problem-solvers who think critically about the world. By the time they graduate, our students' achievements mirror those of high school students', and the result is our mission. Our mission is to create independent thinkers, confident communicators, and engaged leaders but we can’t do it without RCS parents. Our relationship with parents is just as important as the relationship we have with each child. As a result, teachers and administrators are always accessible to talk about our favorite subject — RippKids. We also strive to make parenting easier by providing the tools and resources parents can count on when they need extra help. * Before and after school care offers added flexibility for busy parents while extending the learning. * Full day summer classes provide two weeks of adventure, learning, and play before the official start of summer camp. * In-house wellness and counseling services teach healthy living and give families personalized outlets for support. * Our critically acclaimed Foundations of Education Series invites world-renowned authors and educators to share parenting insights with our community. * Our RippTalks program tackles the most pressing topics affecting RCS families in small interactive forums led by our in-house subject matter experts. Our faculty not only know each student by name but also know their unique personalities and attributes. Small interactive classes help teachers form strong bonds and tailor lessons so that each student is appropriately challenged, supported, and known. Through ongoing interactions in the classroom, on the stage, and on the field, students grow in confidence knowing they have ready access to teachers they respect and trust. These are relationships that last throughout their tenure at RCS and beyond. Our students enjoy learning and rise to each challenge with enthusiasm. By integrating innovation into each aspect of our curriculum, students learn there are many paths to success and see failure as a temporary obstacle to overcome. They view each experience as an opportunity to ask for help, receive feedback, and uncover new problem-solving strategies. At RCS, there is no pressure to perform to a set standard. Small interactive classes allow teachers to use creative lesson planning to scaffold learning, heighten understanding, and deepen engagement. The result is a rigorous and supportive environment that pushes each student to reach their full potential at their own pace.